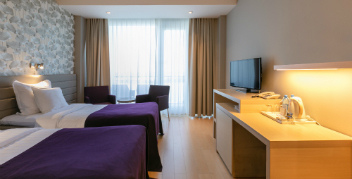 There are beds for 244 persons in the four-star Tervise Paradiis Hotel, located on the beach of the city of Pärnu. 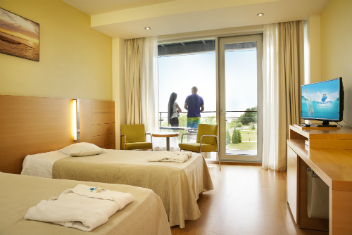 The balconies of most rooms feature a beautiful view to Pärnu Bay. The building houses a SPA, a sports facility, a bowling alley, an a la carte and buffet restaurant, several bars, a public internet access point and the biggest water park in Estonia. Comfortable standard double rooms are there to let you enjoy the best relaxing vacation imaginable. A more luxurious accommodation is available in superior rooms that, in addition to the usual furnishing, feature air conditioning, welcoming water and a possibility to make tea or coffee. Guests visiting us with children are welcome to stay in family rooms consisting of two standard rooms adjoined with a connecting door (four beds + possibility to install two extra beds). Persons seeking more luxury can choose from among suites equipped with saunas in Tervise Paradiis. Rooms for the disabled are also available in the hotel. We wish to make your stay as careless and pleasant as possible. That is why we also offer several extra services here in Tervise Paradiis.